Are you in the planning stages of your paving blocks project? Do you need to decide which mould, rubber or silicone mould is more suitable for your process? We often have customers requesting silicone moulds. While we do not produce silicone moulds, our paving moulds produce an equivalent quality of cast concrete products while keeping cost well below the cost of comparable silicone moulds. More and more homeowners, do-it-yourselfers, builders, and landscapers are making their own manufactured stones today. You can now make stones, tiles, bricks, and pavers for a fraction of what you’ve been buying them for, thanks to companies that manufacture and market concrete molds directly to consumers and tradespeople through the Internet. Now you can make these building products right in your garage, basement, for a shed for pennies each! Each option has its own advantages and disadvantages. 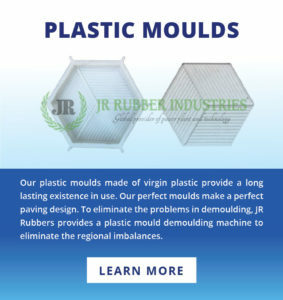 The advantage to JR Rubbers’ proprietary blend of materials is that you get a commercial grade mould designed to be used hundreds if not thousands of times. Our moulds are very robust in design and do not require the use of a release agent while most mould manufacturers recommend using a release agent. The lack of need for release agents also provides additional cost savings from both a material standpoint as well as a reduction in labor cost. Rubber moulds work very effectively and are the “go-to” option for casting concrete pavers. In some cases, a release agent is not required when casting concrete in these moulds, but it depends greatly on the components of the concrete mix. Using silicone rubbers may take away the need for release agents (which have the potential to affect the model); however, the oils from silicone rubbers also have the potential to affect the model in some way. Platinum silicone mould rubbers can be appealing because of their great release properties (tin-cured silicones should not be considered for concrete as they shrink over time and deteriorate with age), but overall, we find that the advantages of rubber mould outweigh the advantages of silicone rubber for this paving block manufacturing application. In addition to robustness and cost savings, our moulds provide excellent texture and general appearance as would be expected from an equivalent silicone mould. We stand behind our product 100%. You can be assured that our moulds meet or exceed the requirements of the industry. 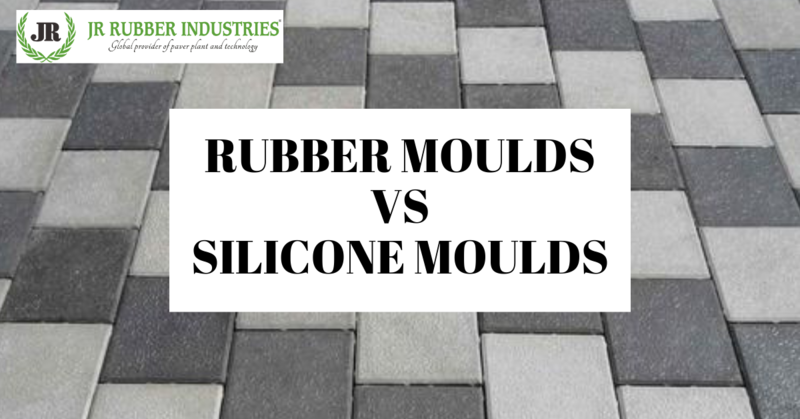 Efflorescence, which produces salt deposits on the surface of concrete, more often occurs when silicone rubber moulds are used for casting (in comparison to rubber moulds). This white residue is aesthetically displeasing and to remove it, you may need to use solvents or other chemicals. In line with this, the overall color quality of the cast parts seem to differ depending on the mould material; concrete cast in rubber moulds tend to display more vivid color, where colors may appear muted when casting in silicone rubber moulds. Silicone rubber moulds cost about twice as much as that of rubber moulds. This is because, by weight, it would require more silicone rubber than polyurethane rubber to create the same mould since silicone is denser. 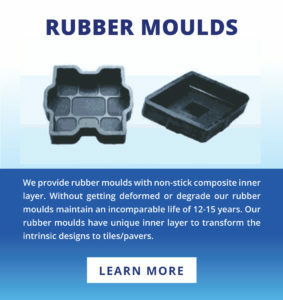 Cured polyurethane rubbers exhibit physical properties that are generally “tougher” than silicones, so they are more resilient to wear and tear when moulds are used repeatedly for years. 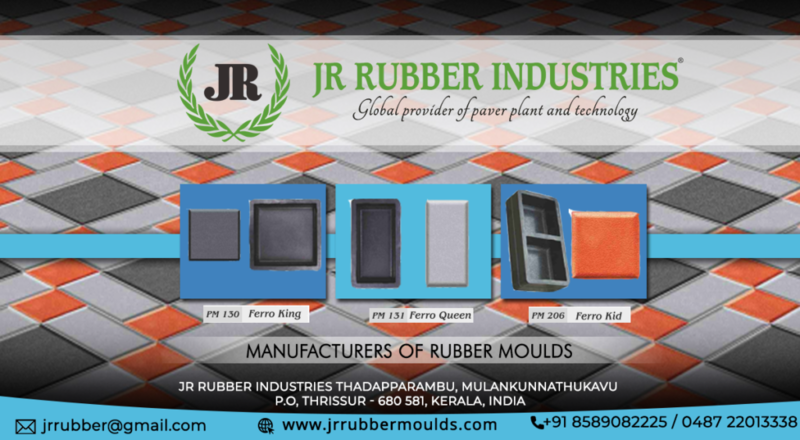 Here at JR Rubbers, we often recommend the use of rubber to make moulds for concrete casting (e.g., concrete tiles, panels, pavers, bricks, countertops, edging, etc.). 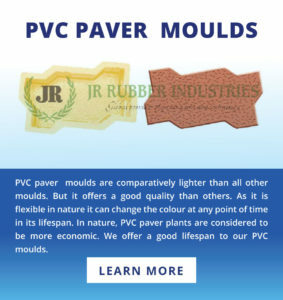 Established in 1993, we have been manufacturing moulds for wet cast concrete pavers/tiles, providing the complete solution for exterior flooring industry with the manufacture and the supply of moulds, paver machinery, setting chemicals and color oxides and complete technical assistance for paver production with in-plant training and onsite assistance for production.